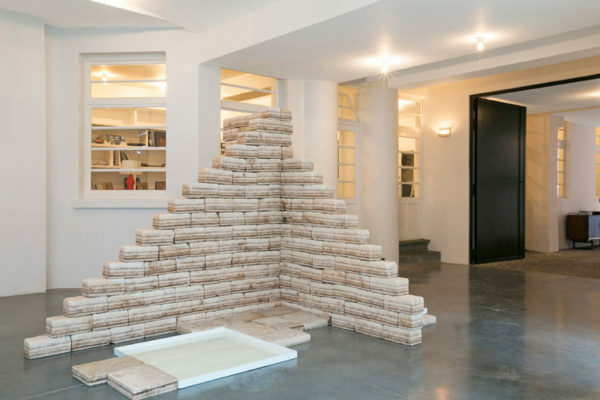 Stijn Demeulenaere, Oortreders, 2013, sound installation, 6'34"
Notes on our equilibrium prend comme point de départ le contexte dans lequel l’architecte et designer français Jean Prouvé conçut sa Maison Démontable 6×6 (1944): un climat marqué par le traumatisme d’après guerre face auquel un sentiment d’urgence et une grande réactivité était nécessaire. Il y a apporté des solutions durables et ingénieuses. Un changement de paradigme s’est opéré depuis; tandis que l’utilisation du progrès et les promesses de l’industrialisation étaient autrefois accueillies avec enthousiasme, de nos jours, elles sont à l’origine d’un changement problématique dans la considération de l’humain envers son environnement. Anno 2017 ; nous pouvons facilement constater que nous vivons dans un état d’urgence. Sans tenir compte des conflits économiques et politiques, la crise écologique est une menace mondiale imminente, qui ne reçoit pas l’attention ni l’action qu’elle réclame à cor et à cri. L’indifférence institutionnalisée face à la limitation des ressources naturelles affecte notre présence sur terre, à une échelle qui ne peut être renversée. A travers des œuvres qui se présentent comme des phénomènes naturels dispersés dans l’espace d’exposition, Notes on our equilibrium vise à raviver la conscience et la réflexion concernant notre impact sur l’écosphère. Les travaux d’Adrien Tirtiaux, Richard Long, Bea Fremderman et Edith Dekyndt expriment la fugacité de l’existence humaine par rapport à la chronologie de notre planète. L’imprévisibilité des forces naturelles domine notre destinée soulignant notre incapacité à établir un contrôle total sur cette Terre. Le déni des faits énoncés, résulte la prétentieuse conviction que l’on peut imiter artificiellement la nature pour se divertir et jouir de ses splendeurs. Vaughn Bell, Stijn Demeulenaere et Carlos Irijalba explorent les symptômes de cette attitude dysfonctionnelle. Cette lutte continue pour le pouvoir et le contrôle sur les ressources naturelles a dégénéré en un abus agressif et envahissant. Le processus d’extraction industrielle à grande échelle s’est inscrit dans le paysage terrestre, et la pollution contribue chaque jour un peu plus à cette mutation, comme l’expriment les œuvres de Julian Charrière et Maarten Van den Eynde. Isabelle Andriessen, Tue Greenfort et Nicolas Lamas explorent l’ère de l’Anthropocène, soit l’influence humaine sur la biosphère. Les récentes croissances technologiques renforcent davantage les relations de pouvoir entre l’humanité, la nature et la technologie. Notes on our equilibrium inclut finalement une alternative cynique de Alvaro Urbano, qui fait allusion au désir de faire table rase, de s’échapper de ce chaos que nous avons créé, en suggérant un univers parallèle. 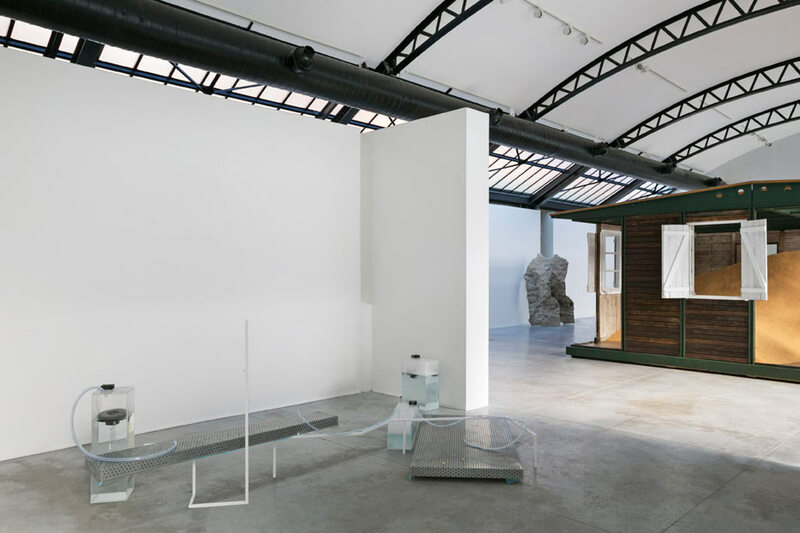 Drawing on the dystopia of the post-human, Isabelle Andriessen lets nature and technology interact in a seemingly balanced ecosystem in The Mesh – strange strangers between life and non-life. The installation includes sculptures containing mycelium, from which mushrooms grow through plastic and metal. Accompanied by a humidification system, the constellation offers a mysterious and haunting sight. 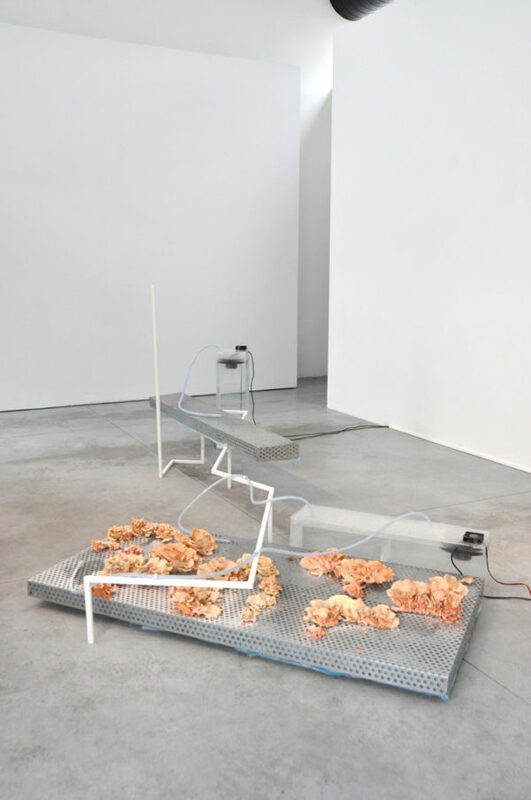 The interactions are set in motion to transform the work over the duration of the exhibition, revealing slow and subtle changes such as the growing of the mushrooms and the dispersing of their spores. 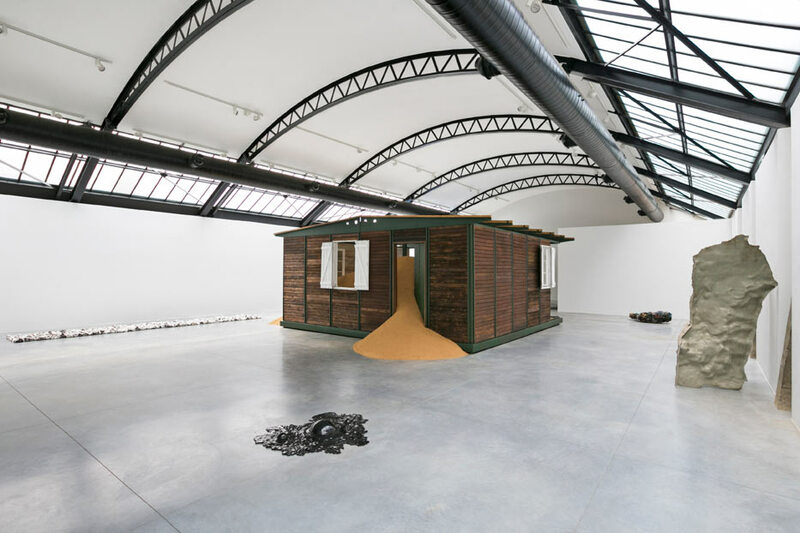 Spreading like a disease, the human body takes these spores outside of the exhibition space, to continue the dialogue between human body, mushrooms and systems. They count as a metaphor for the way we leave traces in the age of the Anthropocene, land, architecture, materials, satellites, technology – most probably installing a presence that will outlive humanity. What will nature look like when humanity has gone extinct? 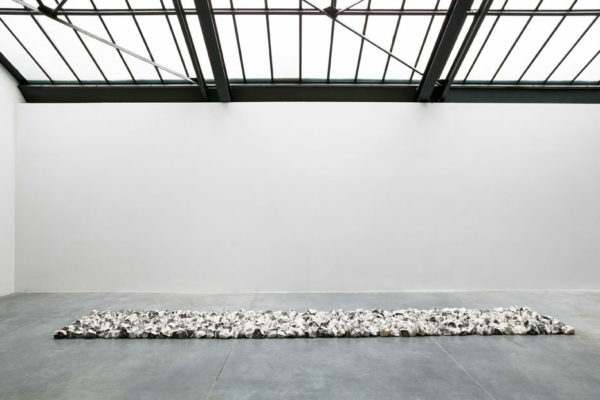 Andriessen aims to play with the seemingly rigid boundaries between life and non-life and human and non-human, and how they get confused along the force of the Anthropocene as a post-human scenario. Offering the visitor an intimacy with nature, Vaughn Bell’s Village Green is set up like “personal biosphere”. 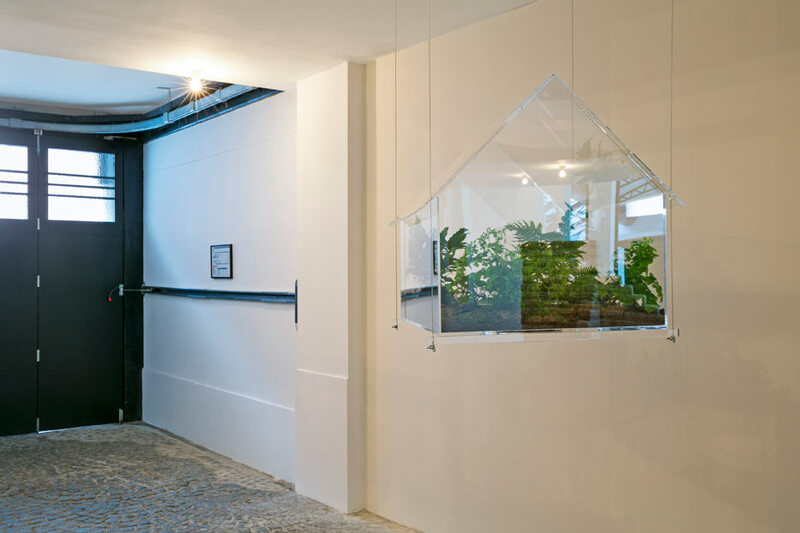 This plexiglass structures takes the form of a house invaded by native plants, always sourced from the indigenous varieties location where the work is presented. 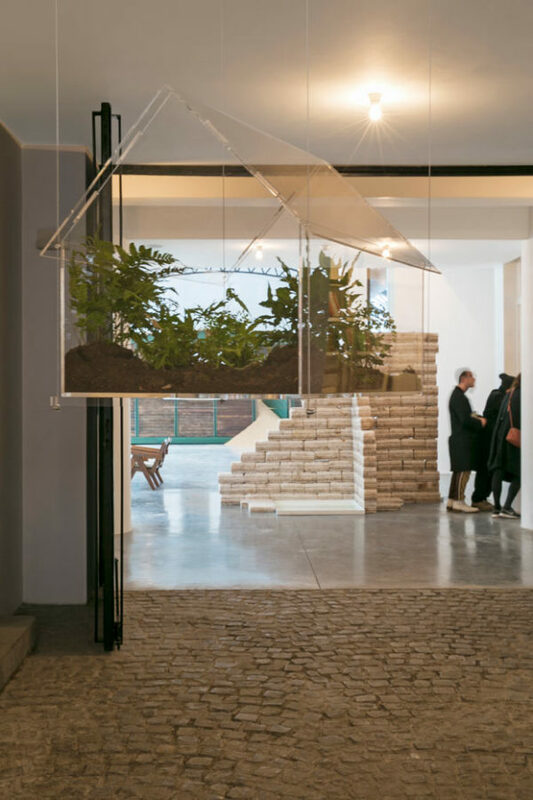 The visitors are invited to place their heads within the structure for a sensory immersive experience of the scent and touch of the plants and soil, as a cure for contemporary urban life, infected with concrete landscapes, WIFI radiation and diesel fumes. The artist started with this serie in 2008, and created both portable editions to carry nature everywhere, as well as “Personal Home Biospheres”, bringing the landscape and nature into domestic settings. 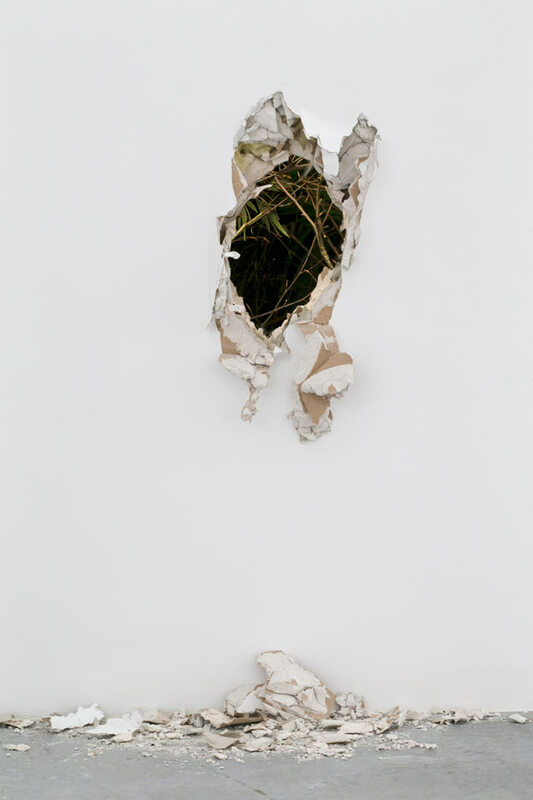 She creates a body of work in which plants and humans co-exist in a relation that is similar to that of pets and owners. Her humorous and almost pathetic works tried to re-ignite feelings of engagement and care over the nature that surrounds us. 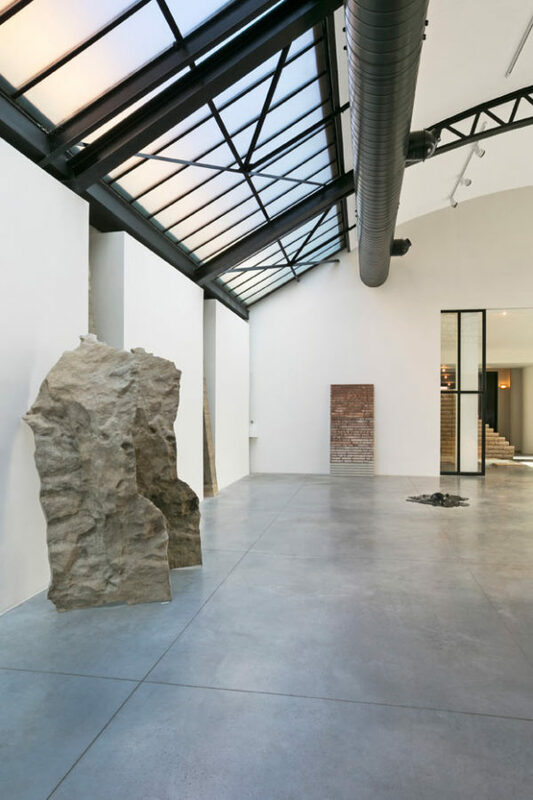 The columns emerging from salt blocks, accompanied by enameled steel basins filled with saline solutions convey a mysterious landscape. The saline solutions originate from Argentinean lithium deposits, extracted by the artist on one of his adventurous excursions into remarkable sites that count as a testimony of the influences exerted by humankind on our geological landscape. They are placed in a seemingly symbiotic relationship with the salt blocks, though speak of opposites. Lithium counts as the material of the future, fueling electronic production, whereas salt beds speak of durational processes of time and investment. Charrière refers to the etymology of the word fossil, which translates literally as “obtained from digging’, a metaphor for going back in time to unravel geological occurrences. 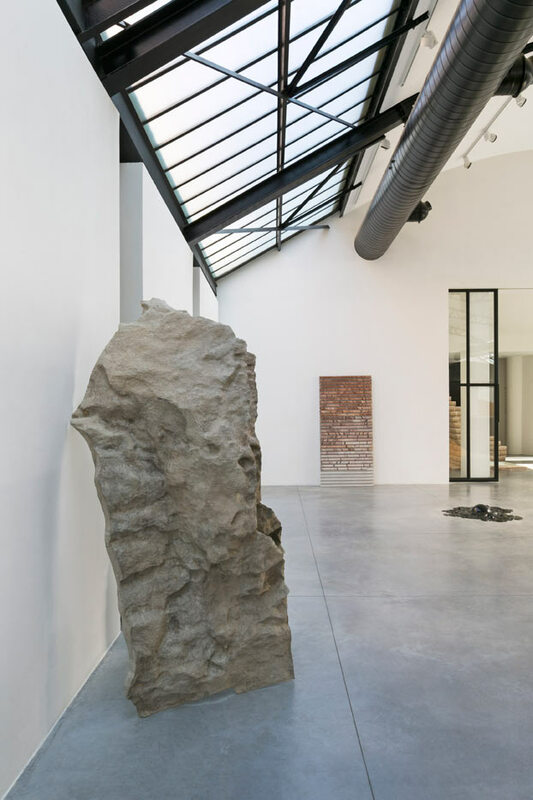 Julian Charrière’s work evolves through project-based investigations in which he actively digs into the geological memory of his research context. 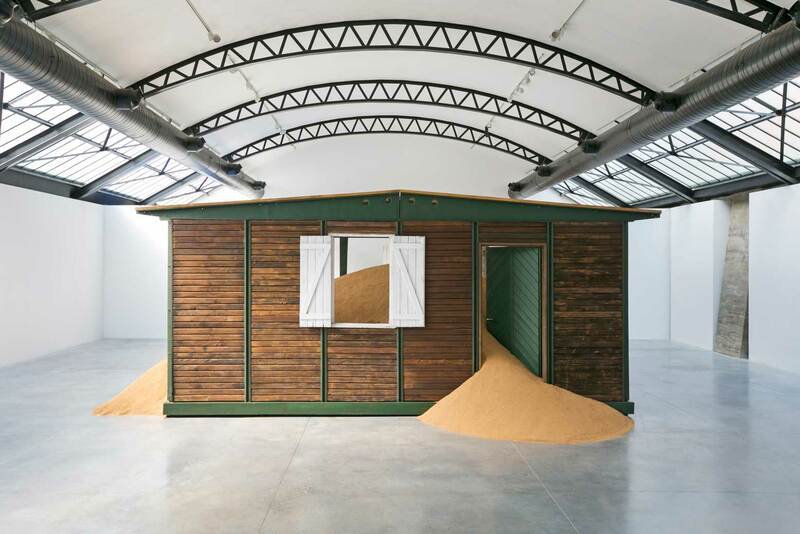 Site-specific in approach, he embarks upon durational dialogues with these natural sites. The artist hereby aims to reveal how human civilization and the natural landscape are inextricably linked, exerting influence on one another and leaving traces within each other’s history. The series of nearly palpable canvasses by Edith Dekyndt capture the process of capillarity. This physical phenomenon arose when the stretched pieces of fabric were placed within trays filled with coloured liquids such as wine, vinegar and coffee. The liquid rose up against gravity, within the fibres of the fabric, resulting in organically made drawings on the canvasses. However, after the course of some days the artist had returned to her works to found them eaten up by ants. The drawings caused by the capillary action had disappeared and were gradually replaced by a pattern of voids. 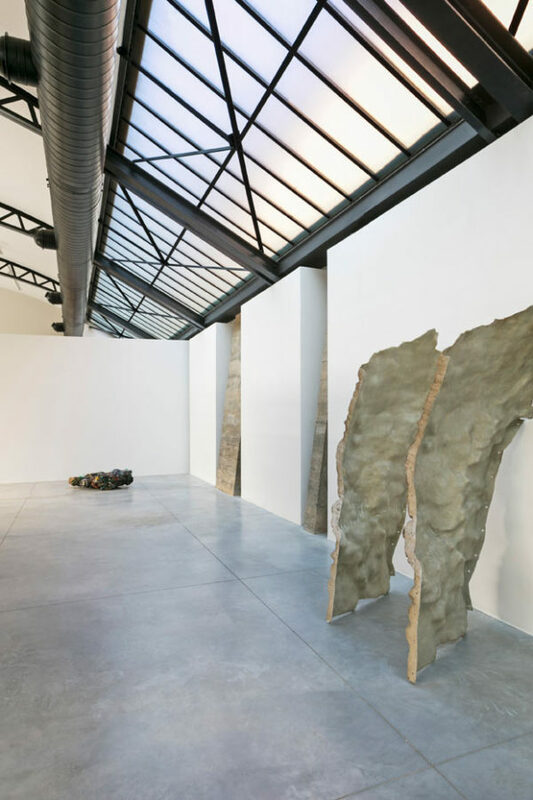 By allowing nature to take possession of the works, deforming them with unforeseeable processes, Dekyndt co-shares the artistic authorship with nature. 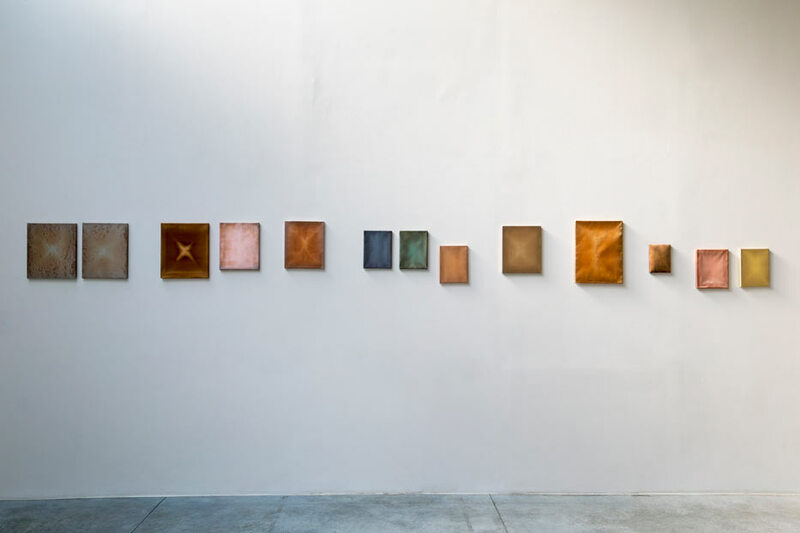 This series made during a residency in Akumal, Mexico was influ- enced by the humidity and the heat of that specific moment in that spe- cific place, making it a materialised testimony of the artist’s memories. Edith Dekyndt is interested by the processes that ignite a certain form, a moment, an action. 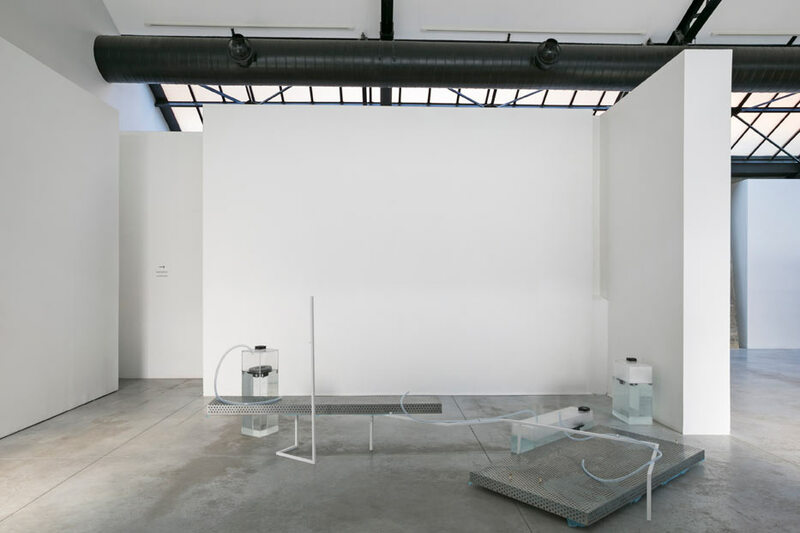 By deploying a methodology that includes both chemical and physical experiments, the artist reveals what normally remains hidden, impalpable or ephemeral. Oortreders is a sonic composition based on recordings the artist made during the 2013 Sonic Mmabolela residency in Limpopo, South Africa. 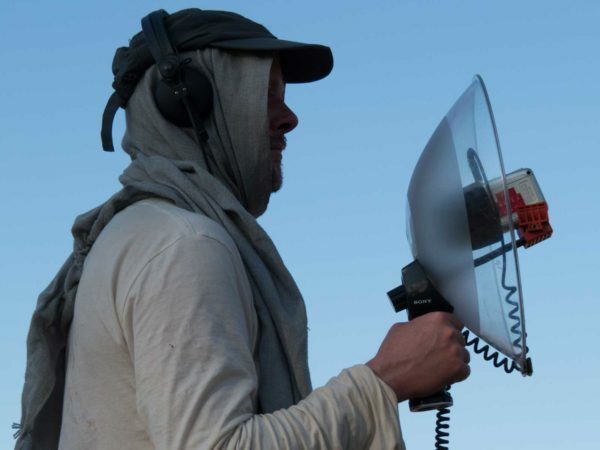 A group of 16 sound artists and composers gathered in the Mmabolela reserve for two weeks to make field recordings, present their work and engage in discussions. 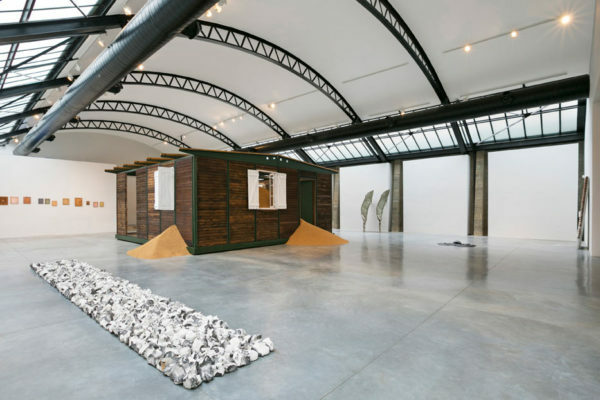 Each participating artist was asked to make a composition with the sounds that they recorded. Oortreders was Demeulenaere’s contribution to the compilation. ‘Oortreders’ is the Afrikaans word for ‘trespassers’, however in his own Dutch mother tongue, ‘oor’ means ‘ear’. So Oortreders is somewhere in between ‘trespassing the ears’ and ‘ears trespassing’. The composition layers the original sounds into a heavily processed re-enacted version of the South African landscape, followed by a more calm and natural-sounding sequence. At CAB a surround sound version is placed outside in the courtyard to blend the exotic South African recordings with the urban soundscape of Brussels, playing with the viewer’s perception. The blooming scent of sprouting chia seeds diffuse subtly in the exhibition space. 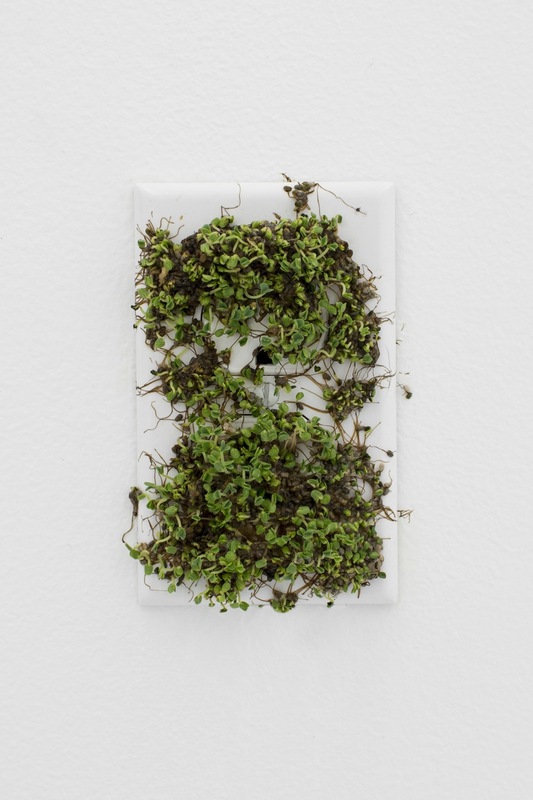 Bea Fremderman frequently installs this active process of growth and decay on different carriers such as clothing or in this case, electric outlets. Being part of our everyday lives, these objects are hereby mutated to count as testimonies of our ongoing battle with nature. The reaction to this constant and gradual power-struggle becomes apparent in the chia sprouts that subtly but persistently are taking over the electric outlets. These outlets symbolise the electric fuel feeding our contemporary society – now deemed useless. The artistic practice of Bea Fremderman is primarily ignited by a sense of eco-anxiety and apocalyptic despair. 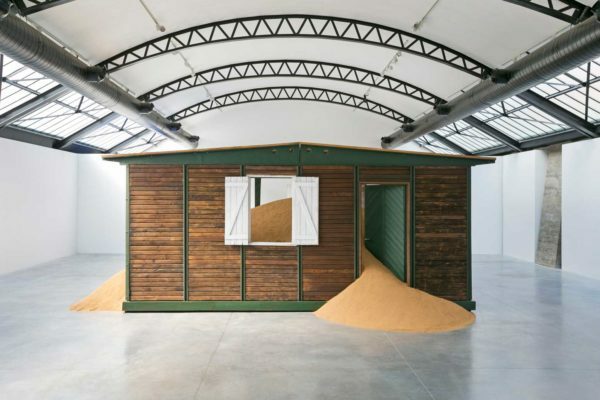 She imagines dystopian environments set in the future, in which humankind has lost the self- caused battle with nature. 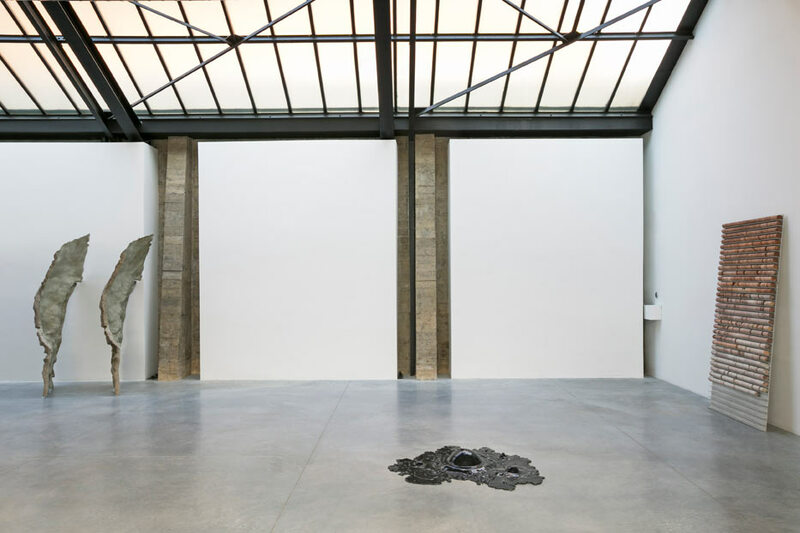 But rather than giving into a sense of defeat and angst in this post- human scenario, the artist considers the awaiting catastrophe as the opportunity for radical societal change. EQUILIBRIUM erects on a plinth almost as an archaeological artefact, a remnant of an era long foregone. The composition is made up of styro-foam implanted with artificial oyster mushrooms, evoking the dichotomy between the natural and the artificial. The title EQUILIBRIUM speaks of ideas of balanced ecosystems in which separate entities co-ex- ist in symbiosis, a reality from which we drift further and further away. 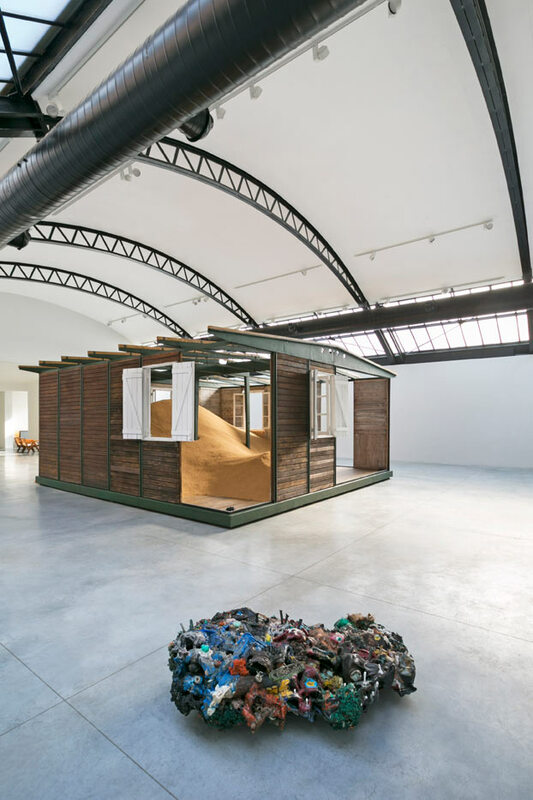 The works of the multidisciplinary Danish artist have, from the outset, shown a critical concern for our perception of Nature and for themes such as ecology and the handling of natural resources. Through the language of contemporary art, he formulates a direct critique of current economical and scientific production practices. 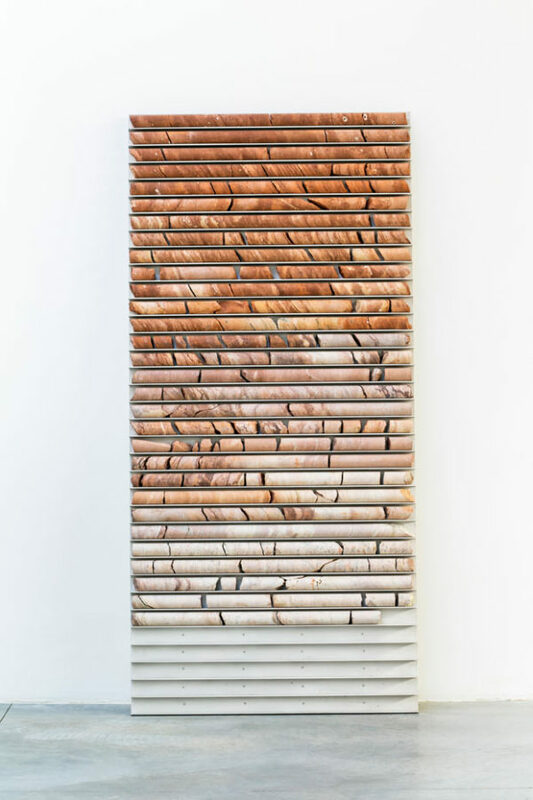 A range of drilling cores from a fluorite mine in the North of Spain unfolds itself as a time line or film stock on a rigid aluminium display rack. These crystallised minerals extracted 300 meters below the surface of the earth, collect the last 32 meters of critical point be- fore the source. Fluorite – as being one of the main components in the production of aluminium – hereby becomes the mineral substance from which to reflect upon how mankind digs up geological material from profound depths unto the surface, but is only superficially capable of perceiving earth’s chronology. 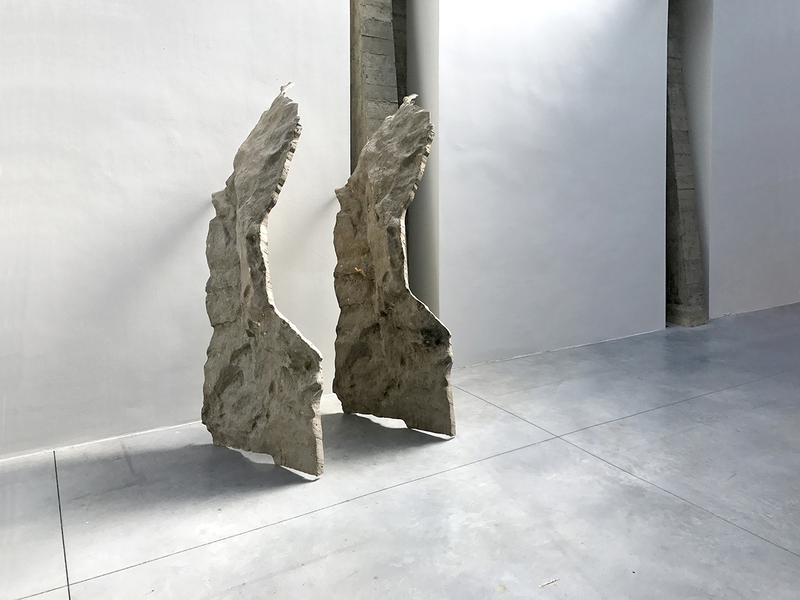 The work forms part of The Surface (2014-2016), a body of work in which Carlos Irijalba researches the behavior of geological matter and biomass and how these can relate to human perception of time and space. Stone Reel therefore accounts for the relativeness of mankind’s temporary passage on earth. 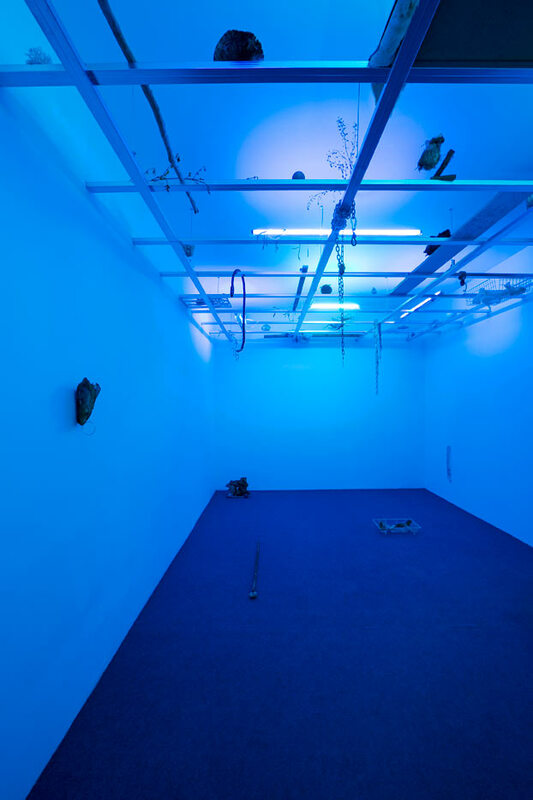 A site-specific installation by Nicolas Lamas transforms CAB’s video room into an alienating setting where the organic and the post-hu- man interact. 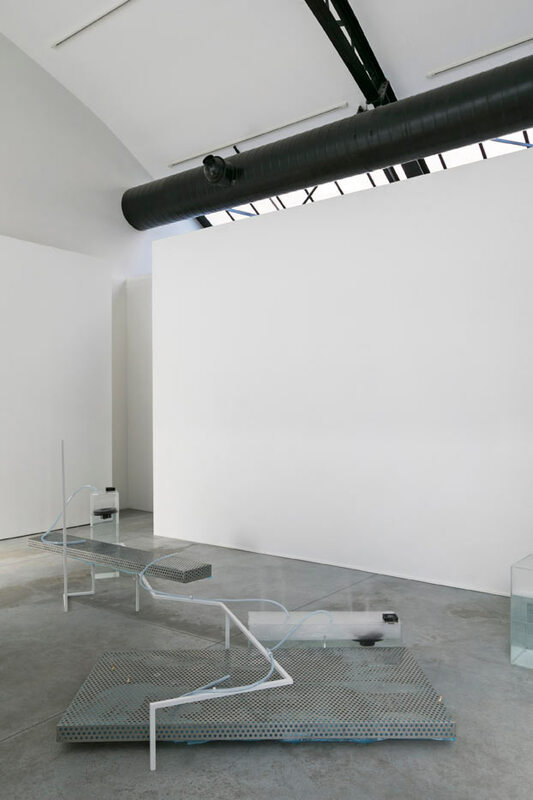 A suspended grid divides the space into strict and rigid segments, in which ambiguous objects appear. They seem to have origi- nated from a symbiosis between organic materials and industrially made consumerist goods. 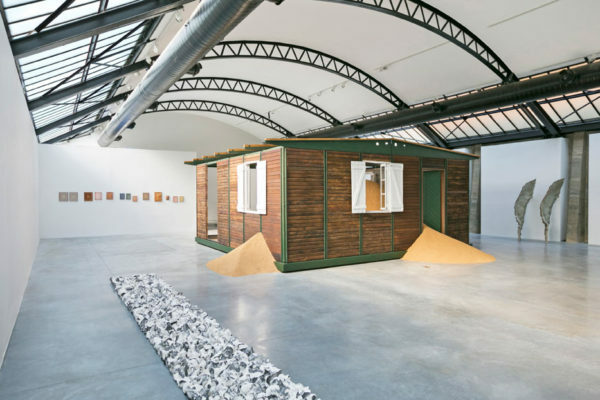 Lamas evokes an environment in which mankind has disappeared and in which nature has found a way to co-inhabit an ecosystem with the leftovers of our contemporary civilisation, that are autonomously further evolving. Lamas’ practice focuses on our constant pursuit of order, measure and control of the laws that govern the physical world – as expressed in the structuring arrangement of space by the gridded ceiling. 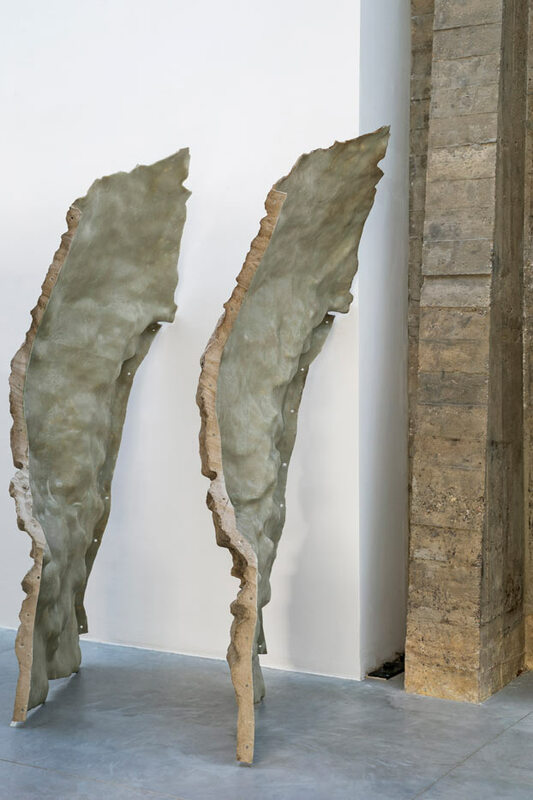 This results in a body of work that revolves around the interaction between things, the contexts in which they coexist and how they create other kinds of associations, exchanges and potential combinations without established rules. 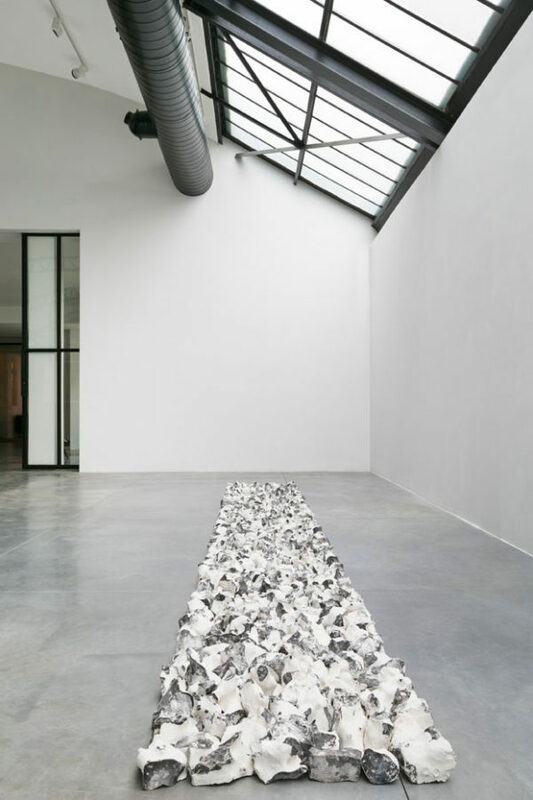 A line of delicate flints unfolds itself, drawing on the juxtapo- sition between the eccentricity of nature with its uncontrollable and uneven shapes, and the rigidness of geometric forms conceived by mankind. 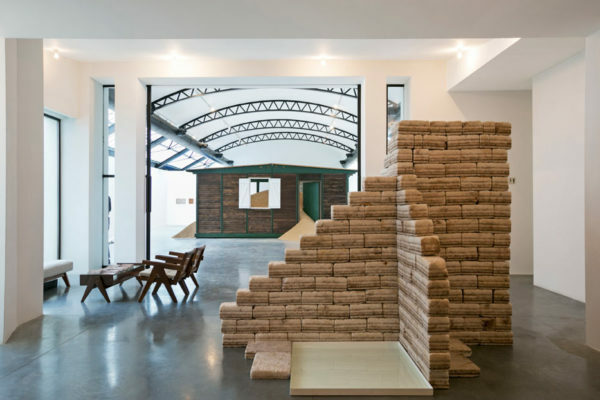 Long’s practice evolves through a constant search for balance between these two models. 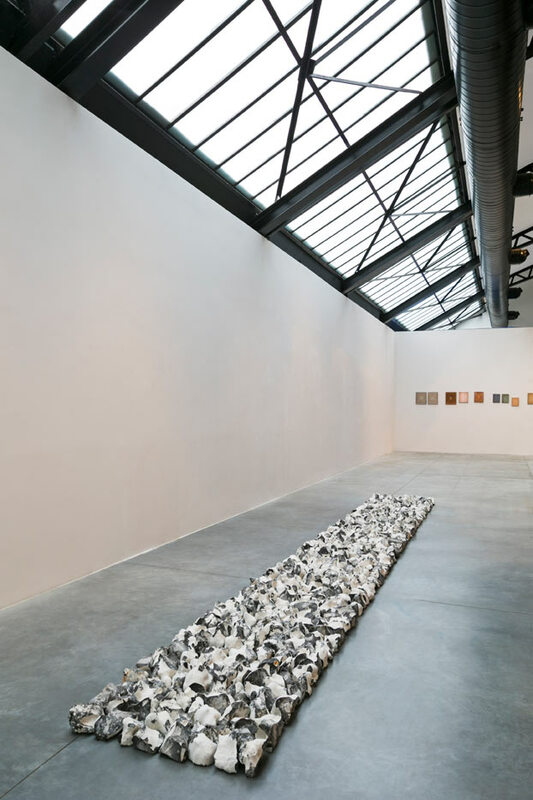 Richard Long is one of the foremost Land Artists, a movement start- ing in the 1960’s to reaffirm the relationship between the artist and his environment, while at the same giving expression to the rising concerns on global warming. His works were often based on intimate and personal encounters with nature, through outdoor walks or excursions in remote places. 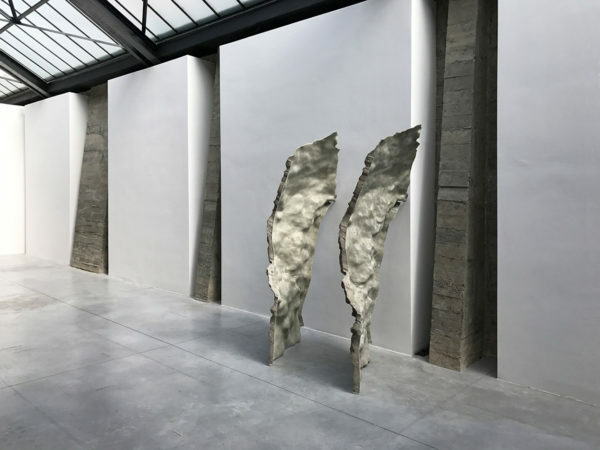 On these occasions, he intervened within the natural landscape to create transitory sculptures using only natural elements. 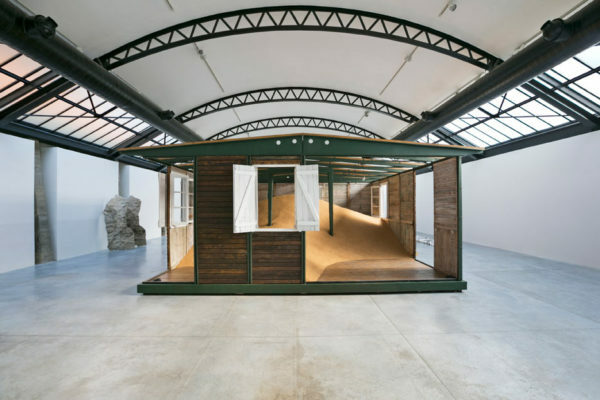 A monumental heap of sawdust encapsulates and takes over the Demountable House 6×6 of Jean Prouvé (1944). Adrien Tirtiaux has placed the house in relation with the motive of the dune, a natural element that is both massive and mobile, echoing the modularity of Prouvé’s designs. 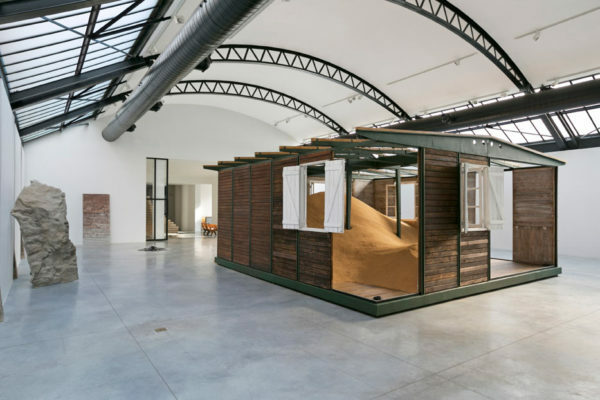 Responding to the big ventilation pipes characterizing CAB’s architecture, the dune was literally sculpted by the wind, its shape and curves determined by the openings made in Prouvé’s house to allow the wind to flow in. The interplay between the sawdust material and the missing panels evokes a paradox: more specifically of sawdust being a natural material, but one that can only be obtained through industrial woodworking processes. 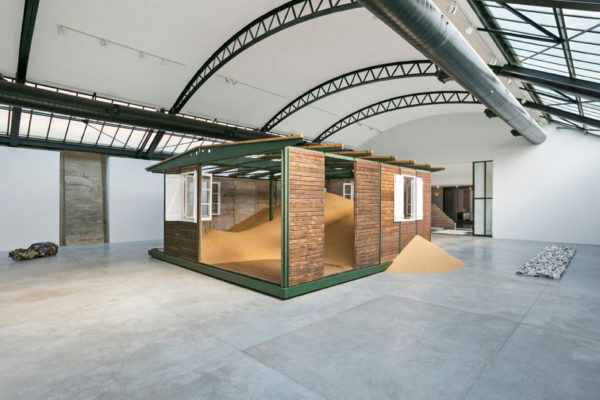 Prouvé au vent draws parallels between the industrial elements of the structure, its assembly by man, and the way the earth is modelled by cyclic natural phenomena. Almost suddenly, a crumbling wall seems to give access to an- other reality, a hidden fictional landscape. 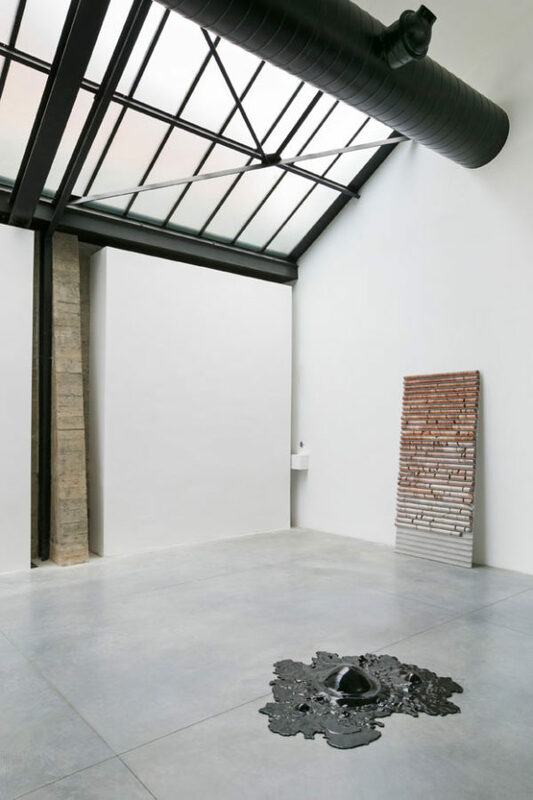 This illusionary space appears in a context where it is unexpected and not supposed to exist. A sight of wild nature that hasn’t gone through any analysis or clas- sification. Lush vegetation that hasn’t been subjected to mankind’s will but that has an agency of its own. Perhaps a creature made it by coming inside, perhaps someone discovered it accidentally by making a hole ? 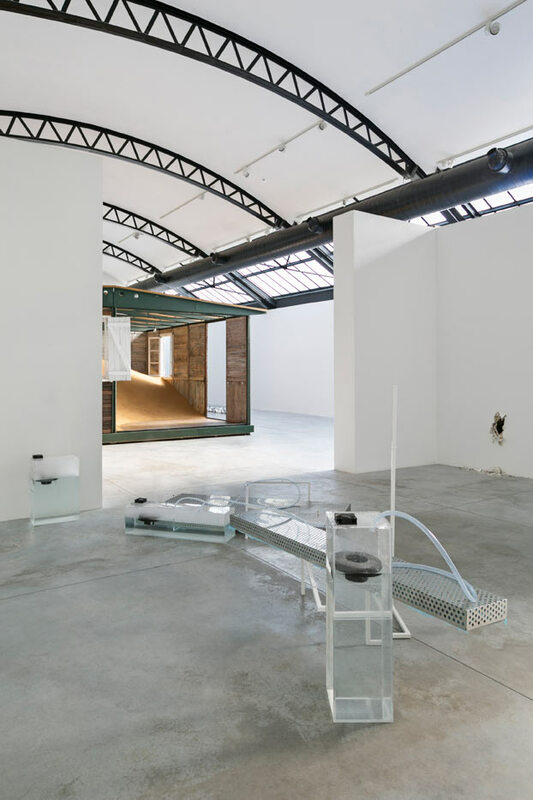 Alvaro Urbano’s practice embraces a variety of media, from film, performance to spatial installations that unfold through an experimental process with a strong interest in architecture, heterotopias and fiction. In March 2008 Maarten Vanden Eynde discovered the existence of “floating landfills’ hovering just below the surface of the oceans. They are layers of plastic debris, not detectable by overhead satellites, but painstakingly visible to the naked eye. They account for only 30% of plastic waste being dumped into the oceans, since the other 70% sinks to the bottom. 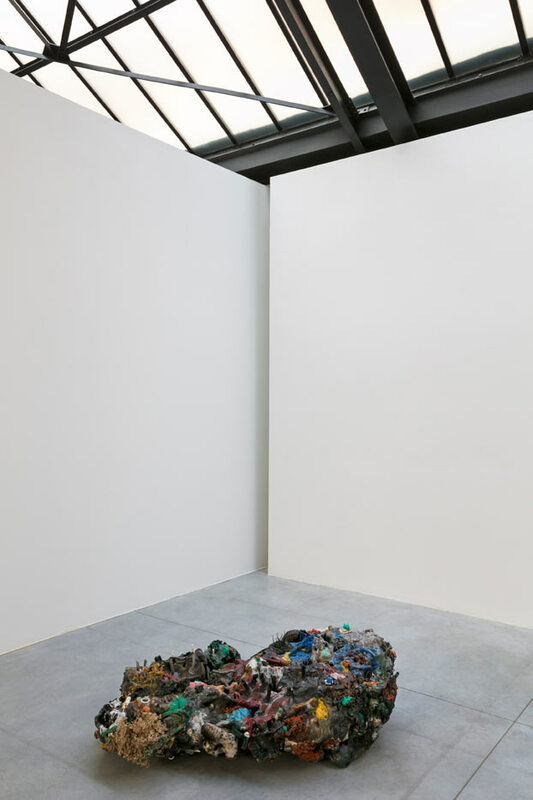 Since this discovery, the artist has been collecting the plastic trash from these floating landfills, always during expeditions in collaboration with scientists and oceanographers. 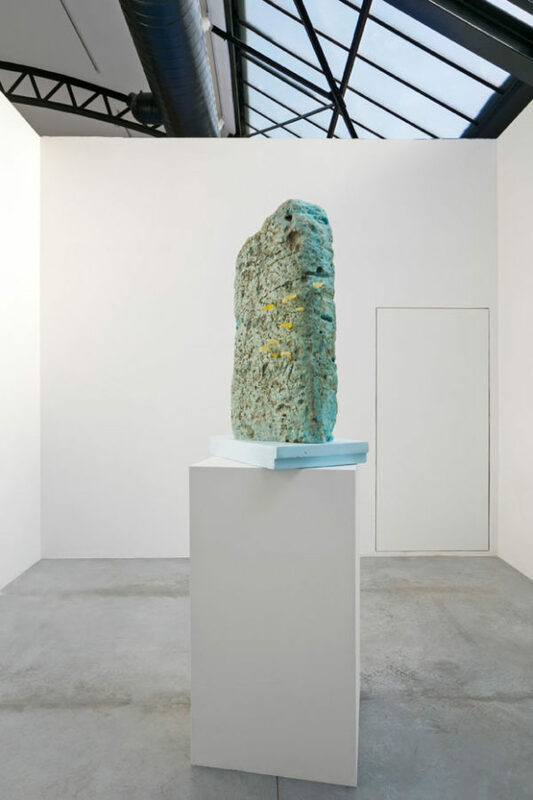 The debris is each time being molten into different versions of Plastic Reef, sculptures with the characteristics of a coral reef. Maarten Vanden Eynde’s practice is grounded in what he calls “Genetology”, a self-invented science covering the several research such as ecology, anthropology and archaeology. He departs from the idea that we should rethink oppositions such between technology and nature to better perceive our world.